Carotid arteries are the major blood vessel, one on each side of neck that supply the blood to the brain. These carotid arteries can be narrowed (stenosis) due to buildup of plaque inside their lumen, reducing the blood supply of brain and increasing the future likelihood of stroke. Plaque develops due to deposition of cholesterol, fat, and other substances, a condition called Atherosclerosis. The risk factors that can contribute in atherosclerosis or plaque development in carotid arteries include family history of atherosclerosis, age, hyperlipidemia (high levels of cholesterol), hypertension (high blood pressure), diabetes, smoking, obesity, and sedentary life style. 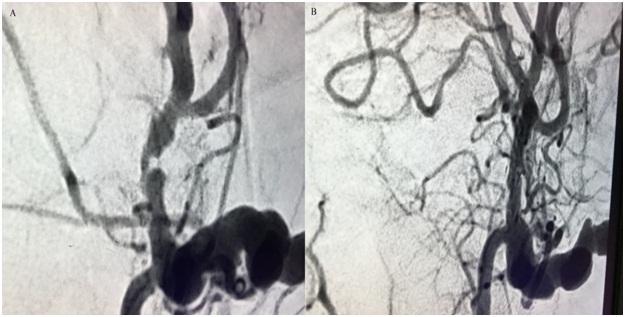 The treatment of carotid artery stenosis include lifestyle changes, medical management, Carotid endarterectomy (CEA), Carotid artery stenting (CAS) and carotid artery angioplasty. The choice of treatment option recommended by your physician depends on the percentage of narrowing of your carotid artery and the severity of your symptoms. CAS and angioplasty is a minimally invasive procedure and performed endovascularly in an Angio Lab. In angioplasty and stenting, your endovascular surgeon will make a small incision in your groin and pass navigating catheter through femoral artery up to carotid artery. The surgeon will then introduce a balloon at the site of narrowing and inflate it. This technique will open up the narrowing and restore the blood flow. This can be combined with the placement of a metallic stent to keep the vessel open and to reinforce its walls. The balloon is then deflated and removed from the body, leaving the stent inside the carotid artery. (see figure): Over time, cells lining the carotid artery will go around the stent to hold it in place. Before the stent placement procedure, you will be pre-treated with aspirin and clopidogrel which will be continued for 6 months after the procedure. Beyond 6 months of dual antiplatelet therapy, you will on aspirin indefinitely. Please see neurosurgical procedures for information on carotid endarterectomy. Uehara T, Minematsu K, Ohara T, Kimura K, Okada Y, Hasegawa Y, Tanahashi N, Suzuki A, Takagi S, Nakagawara J, Arii K, Nagahiro S, Ogasawara K, Uchiyama S, Matsumoto M, Iihara K, Toyoda K; PROMISE-TIA study Investigators.. Incidence, predictors, and etiology of subsequent ischemic stroke within one year after transient ischemic attack. Int J Stroke. 2017 Jan;12(1):84-89.